Cangkuang Temple is located in the middle of a lake in the natural Kampung Pulo, Cangkuang area, Leles District, Garut, West Java. Berketinggian this place 600 meters above sea level is circled the mountains; they are Mount Haruman, Kadaleman Sand, Sand Gadung, Guntur, Malang, Mandalawangi, and Kaledong. Hindu temple on the legacy to the century-8 is located in the middle of the lake so that it looks unique. This temple is also the first time and found the only Hindu temple in the land of Sunda. Community around temple called Candi Cangkuang. The name is taken from the family tree cangkuang (Pandanus furcatus), which are mushrooming in the area at the time of first temple. 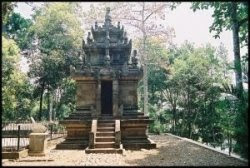 Cangkuang temple was first found in December 1966 by Uka Tjandrasasmita (Writing History Team member West Java) based on reports Vorderman (1893) on the remains of sculpture Dewa Siwa and Muhammad Arif ancestral graves in the area Cangkuang. In addition to temples, the research team also found a number of locations in the temple artifact originating from the four cultures, namely neolitcum, megaliticum, Hindu, and Islam. Pelita II, namely in the year 1974 until 1977, temple reconstruction can be completed. The temple building Cangkuang very simple, which is made of andesite stone without any relief. 8.5 meter high temple (m) building with a foot of 4.5 mx 4.5 m. This temple has one room with the door facing east. Inside the temple there is a s Siwa tatue as 62 cm. Although the condition is still good but can not topple the general opinion is that developing in West Java there is no temple. And most people know the city Garut, West Java, a production with its dodol oeuvre. Cangkuang temple is located in the middle of a lake (the lake) in the natural Kampung Pulo, Cangkuang area, Leles District, Garut, West Java. This place is a valley with an altitude of 600 meters above sea level be circled the mountain, ie, Mount Haruman, Kadaleman Sand, Sand Gadung, Guntur, Malang, Mandalawangi, and Kaledong. From Garut city center, this place is around 17 km. Not far from the square (the center of the field), from the direction toward Tasikmalaya Bandung, in the street have the green board guide also reads Cangkuang temple, complete with a direction sign panahnya. Together with my friends, Mono, direct the car swerve to the left. At the mouth of the road there is a line drawn normal gig is a horse, we slow the pace vehicle for the road that did not fit too wide. Travel is diverting, at the far left and right eye looked disuguhi of the green rice paddy fields in the berundak-undak. Akan but do not terlena, remain cautious because the pavement is sometimes perforated. Approximately 13 km have been followed; we met the road fork, then according to our guide that is not fully lead. "Sorry, Sir, if want to Cangkuang temple straight or right," ask me to a father who was being treated sawahnya. The father was friendly with the purpose of showing us the direction. So, do not worry about the wrong way because there are very friendly and shows the direction of our destination. We also had time to stop in a field that small place was quite high and we can see the temple complex Cangkuang located in the middle of the lake from the top. After that, we continue the search for a place that allows for parking of vehicles. Approximately 2 km of land we found was quite broad and we titipkan while the local population. Then, go again with the journey on foot through the lake. Around in the lake, we see houses and a typical local resident who is fishing with a net or fishing rod. After some walking as far as 1 km, we will meet a bamboo house, no other place Cangkuang temple tour manager, as well as counter incoming payment plus rent a raft to cross the lake. "However, why do not we park the vehicle just nearby," said Mono laughing while tickled. And indeed, in the area near the counter area available for vehicle parking. Local residents also said that there are two alternative routes, short routes can not be passed by four-wheel drive and full path of the second path that can be passed by four-wheel vehicle to the location (the entrance counters crossing). And to go to temple complex, we have to cross the lake using a raft that has been provided by the manager, about Rp3.000 per person. With the entry ticket is quite cheap Rp2.000 (adult) and for children enough Rp1.000 per person. Temple complex is shaped like a small island and just around the temple on foot only. Lodging In the city of Garut is very much. For more close to the temple, you can choose lodging that is located in Cipanas, Garut. Here, there is a wide range of hotels. Price range starts Rp75.000-2000000. In addition, the confusion does not need to find a place to eat in Garut, because there are various types of restaurants, ranging up to the typical Sundanese other types of cuisine. Towards the evening, decided to leave Kampung Pulo. Create a comfortable place where we do not want to go home.